Pilates for Older Clients – we believe you are never too old to try something new! As we become older we tend to exercise less, and problems associated with excess weight, poor posture and weak body tone tend to increase, making it harder to keep regular exercise a part of life. At Intelligent Pilates, we understand that it can be hard to motivate oneself to get moving again. Pilates is a safe, low impact form of exercise that is suitable for all ages and it is particularly suitable for those of us who may not have exercised in a while. 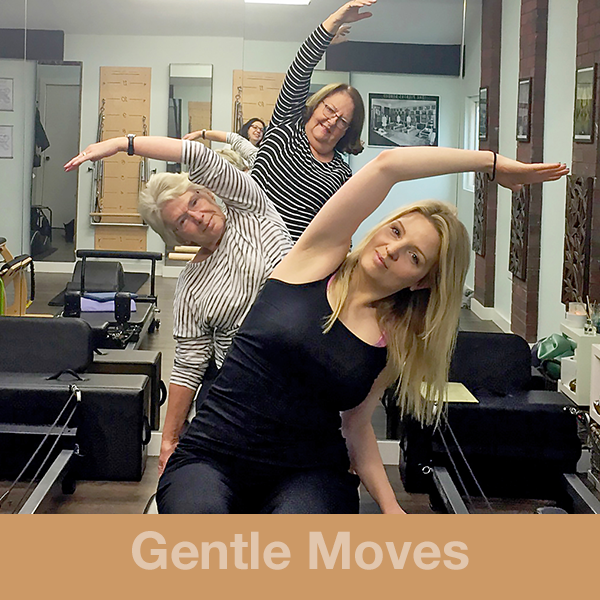 Intelligent Pilates offers 'Gentle Moves' Pilates classes, tailored to the over 60s. Our gentle, balanced workouts will help to improve your general health, reduce back and shoulder pain and boost your concentration, balance and co-ordination. And we can teach from both sitting and standing positions, depending on your level of mobility. Give your body a mellow boost and try our 'Gentle Moves' classes for the over 60s. Other studio sessions available, please view our class timetable for details.